Click the link to see integral experiment data www.oecd-nea.org/tools/ie/search?q=ifpe from the IFPE database. This will provide a list of all available package identification numbers, their program names and full titles. 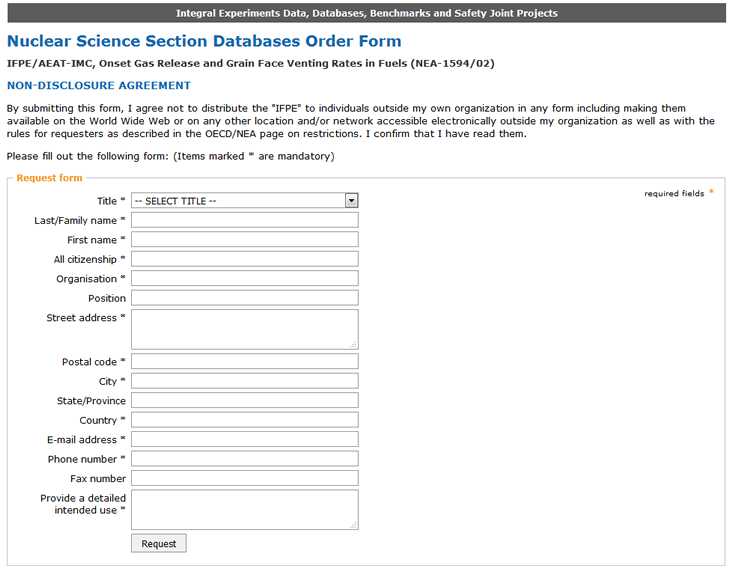 Click on any package number (NEA-xxxx) that you wish to review in further detail. This will take you to the abstract page for that package. From the abstract page, under Section 2, the program names are further links to the request form for that package. Filling out these request forms will start an automated request process. Notice of request acknowledgment and approval are automatically sent via email. The data will be sent by optical media via mail, or via FTP download (if possible and so requested). ), that all IFPE packages are required.